The Residency Penthouse is a superb 5 star spacious contemporary penthouse suite, restored & designed for our most discerning & VIP guests, of 2 rooms with a sundeck of 7 metres, perched two stories high. It features a two person spa marble tiled bathroom, huge open plan kitchen, dining and living areas. The master bedroom is lightly washed with a creamy rag finish and opens; via French doors, onto a balcony overlooking the North Adelaide Cafe precinct. The second master bedroom with French canopied half testa all Brass queen bed, opens on to the sundeck with designer wrought iron dining table & chairs. 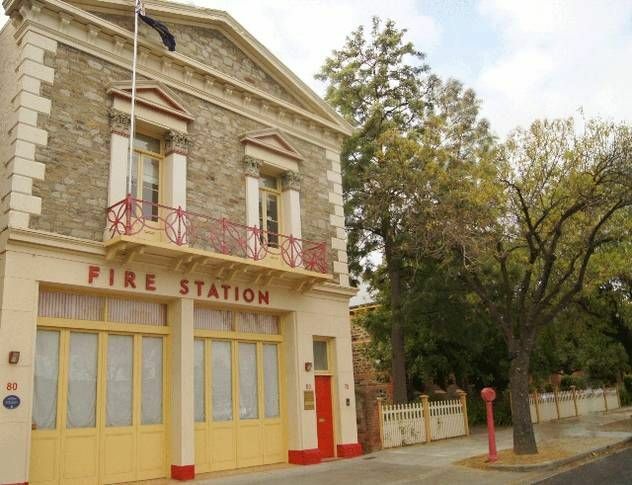 A Uniquely restored 1866 Fire Station, the Fire Station Inn was originally Adelaide's first Fire Station, which has now been converted into luxurious unique accommodation by the North Adelaide Heritage Group. North Adelaide is blessed with the widest and best selection of restaurants and cafe's in Adelaide. From the top award winning silver service eateries, 10 restored hotels, many ethnic restaurants and a proliferation of casual well designed cafe's all featuring personalised service! Our staff are familiar with all of these options and their proprieters and are happy to help you with your selection! North Adelaide is the home of sophisticated dining, with themes, be it sommeliers, wood fired pizza's, cook your own steak, bars with tons of ambience, Thai, Chinese and Vietnamese, the home of the 24hour bakery, the O'Connell Street specialty - the A.B, you name it - North Adelaide has it! A number of our guests reasons to stay in North Adelaide is related to the areas abundance of restaurants, cafe's and hotel nightlife! The Fire Engine Suite is a fully self contained,large open plan apartment. It offers a fully equipped kitchen, king bed, king size spa bathroom and his and hers lavatories. However the highlights of the Suite would have to be the life size, antique fire truck and original fire man's pole in the bedroom! The Loggia is a private suite with the emphasis on Romance and privacy with touches of Baroque accents and burnished jarrah floors. The magnificent two person huge spa bathroom with marble tiles and heated spa is flooded with light with 2 complete walls of glass opaque tiles. The bathroom is surrounded by a walled private courtyard garden with Italiate tiles, Tuscan hued walls, a lions head fountain and slim pencil pines.